You are here: Home › Conflict on Campus › Liberal Zionism › Will Federations Side with Israeli Gov’t or Students Fighting BDS? 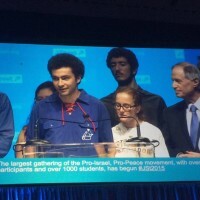 Will Federations Side with Israeli Gov’t or Students Fighting BDS? During my gap year in Israel in 2012, I was exposed to a vibrant, intense debate regarding the Israeli-Palestinian conflict. Between the American and Israeli elections, as well as a military operation in Gaza, there was no shortage of discussion regarding the conflict and the relationship between Israel and the US. Upon returning to America, I was surprised to find an American Jewish community that was very supportive of a two-state solution, yet unable to voice the serious concerns that many members of our community have regarding the Israeli government’s commitment to a two-state solution. I saw a community that was concerned about Israel’s image and direction, yet unable to voice any hesitation about Israeli policy. I saw a community truly struggling to cope with the changes taking place in Israel. On March 13th, Haaretz’s Judy Maltz conducted an unusual interview with LA Federation head Jay Sanderson. Sanderson, who attracted attention last summer for his Federation’s stance against the Iran nuclear deal, had some choice words for the Israeli government regarding its efforts to fight the BDS (Boycott, Divestment and Sanctions) movement on American college campuses. He spoke of the ways in which the Israeli government has contributed to the alienation of young Jews from Israel, as well as the fact that pro-Israel groups tend to “yell and scream” rather than truly engage with the concerns of students. The fact that Sanderson then had to take back his comments, probably under donor pressure, is another symptom of this problem. On college campuses, the approach taken by many Jewish institutions to confronting BDS – fueled to an extent by Israeli governmental activism – has been to offer simplistic answers and discourage critical thinking. Just take a look at any “centrist” or “apolitical” pro-Israel group’s website: there is no mention of settlements or of the occupation, except perhaps to deny that there is one. Palestinians are depicted as little more than potential suicide bombers, and criticism of Israel from Jews living outside the country is often viewed as dangerous and disloyal. These responses demonstrate that the Israeli government is not suited to deal with the BDS movement in a strategic manner. I do not expect the Israeli government to hold a nuanced view on BDS. No government will argue against its own policies, and I doubt that the complicated political reality of American college students is something that Israeli politicians will ever really seek to understand. The recent insistence of Deputy Foreign Minister Tzipi Hotovely that the best way to fight BDS is to claim that Jews have the right to “the entire land,” shows the level to which, quite unfortunately, the Israeli government is out of touch with American Jews and most of the international community. In reality, BDS is garnering more and more support on our college campuses from the mainstream because students see it as a concrete response to the continued entrenchment of settlements and the occupation. The vast majority of Jewish students, as well as other students who are paying attention to the Israel debate on college campuses, do not support the idea of “Israel right or wrong.” We will support policies that are in line with our deeply held values, and that are consistent with self-determination, security, and democracy for both Israelis and Palestinians. Telling students to ignore their moral values and political concerns is not a winning strategy, and it will turn tens of thousands of Jewish students away from the organized Jewish community. I therefore welcome Sanderson’s critique. But I would go one step further. Our Jewish institutions, including the Jewish Federations, must actively support the two-state solution – and distance themselves from the occupation and settlements – if we want to undermine the rise and spread of BDS and promote a positive vision of Israel’s future. Over the past year, J Street U students have been building relationships with Jewish Federations all over the country, encouraging them to show leadership when it comes to settlements and other actions that undermine Israel’s future. In the fall, over 800 Boston-area students signed a letter to Barry Shrage, the head of CJP, asking him to clearly distance his institution from the settlement enterprise by creating a policy regarding donations to settlements. Though the CJP has taken clear and decisive leadership on other issues which they consider to be vital to Israel’s future, they have so far hesitated to speak out on this one. Sanderson, Shrage, and their fellow leaders in Federations and other Jewish institutions must answer two questions: How do they want to relate to Israel in the era of BDS? And to what degree do we want to take leadership to truly stand up for the two-state solution, and to oppose policies that actively seek to undermine that solution? The debate over this answer should not just be held in board rooms, but in schools, synagogues and around the Shabbat dinner table. If Jewish communal institutions choose to take leadership by openly supporting the two-state solution, by condemning settlement expansion, and demonstrating that they stand with democratic Israel inside the Green Line, the ability of the Jewish community to articulate an alternative to BDS will be strongly enhanced, and the pro-peace forces inside Israeli society will be strengthened. If they continue to abdicate responsibility, more students will disengage, the BDS movement will grow, and the prospects for Israel’s future as a Jewish and democratic state will only get bleaker. It’s time to make the right choice.